First off, I want to send prayers out to all of my fellow East Coasters who are encountering the wrath of Sandy. I am afraid but I am more afraid for the people closest to the coastline than I. I can not help but think about the beautiful Atlantic City Beach Cats and I am praying that their instincts are kicking in and they are moving to higher ground. I am praying for the safety of all the people and animals that are in the path of Sandy. It has been some time since I posted. I have been pretty busy with real estate which, of course, is a good thing. Recently I have been overhauling my family room in my home. I have many rescue cats and so I must have flooring and furniture that can withstand the little buggers. Part of my family room is a bar area. Since I love to repurpose, I have done a majority of the overhauling using things I already have. I mixed old paints together to come up with colors to paint the bar area. I used my old kitchen cabinets as wall cabinets behind the bar. I have changed out my laminate for vinyl plank. I am amazed at how neat this stuff is. You can see in the pic the vinyl plank. I sectioned the bar area out using the plank. I am transitioning from the plank to a peel n stick 18 x 18 inch tile that looks like stained concrete. It is really neat in person. Pictures do not do it justice. Obviously I am going for the fun look in the bar area as the room is where we sit by the fire and watch streaming Netlfix movies. I had an old small bar fridge that was pretty beat up and I simple decoupaged it for a new look. I also decoupaged the kind of paper you use for scrapbooking on the back part of the inside of my old kitchen cabinets. 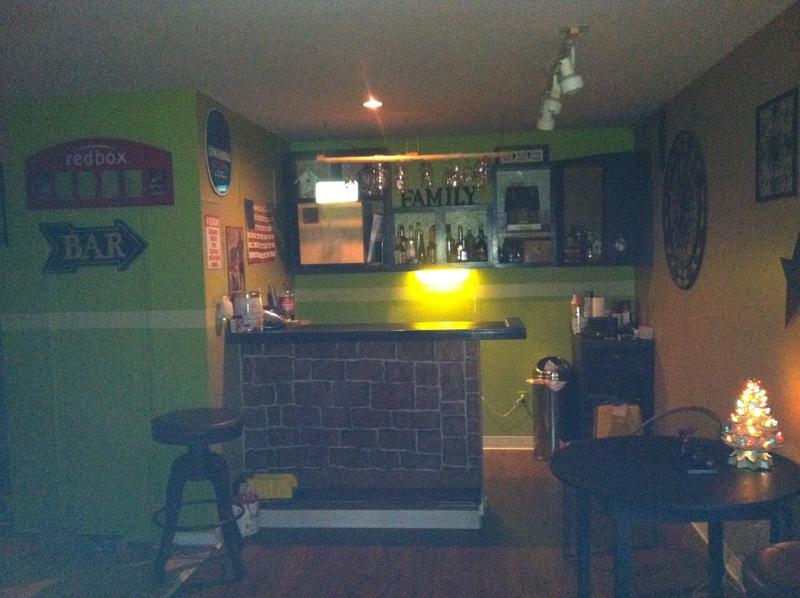 The front of the bar I painted in faux stone for that fun look! I mixed the green color from old paints and then added a fun stripe for interest. I am going to go get an alphabet stencil and I am going to take the same dark grey paint (which I also mixed) and stencil meaningful quotes in the stripe. So I wanted to get a pub table and some old chairs to add to the bar area. I found this old chair while picking up another old chair from a craigslist ad. The nice man gave me 2 chairs for 10 bucks! 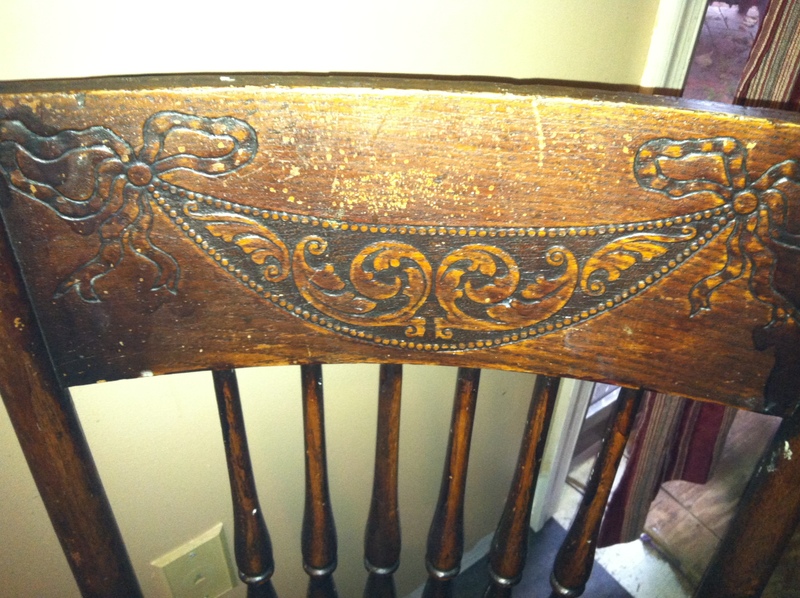 I am very curious about this chair and am hoping someone can tell me something about it. 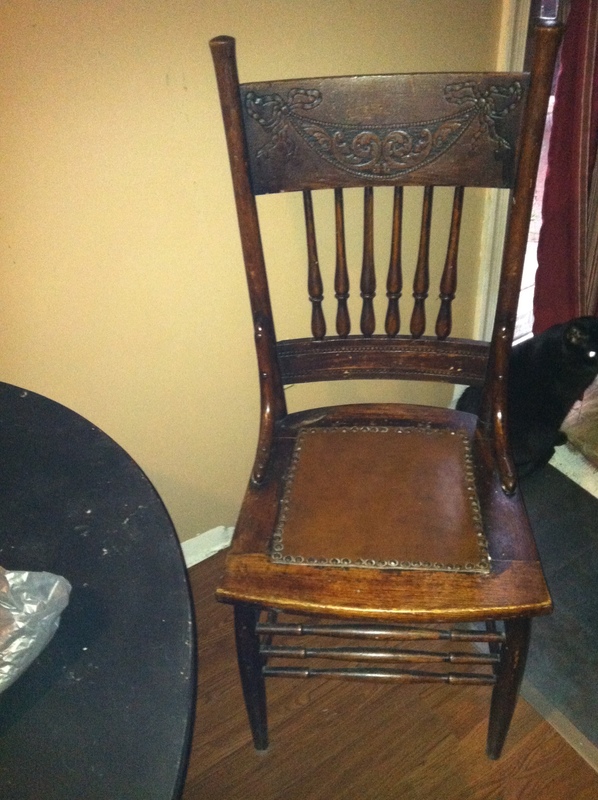 It has a leather seat which is outlined in nailhead trim. It also has this great carved area. At first I thought how neat it would be painted but the more I look at it, the more I love it as it is! 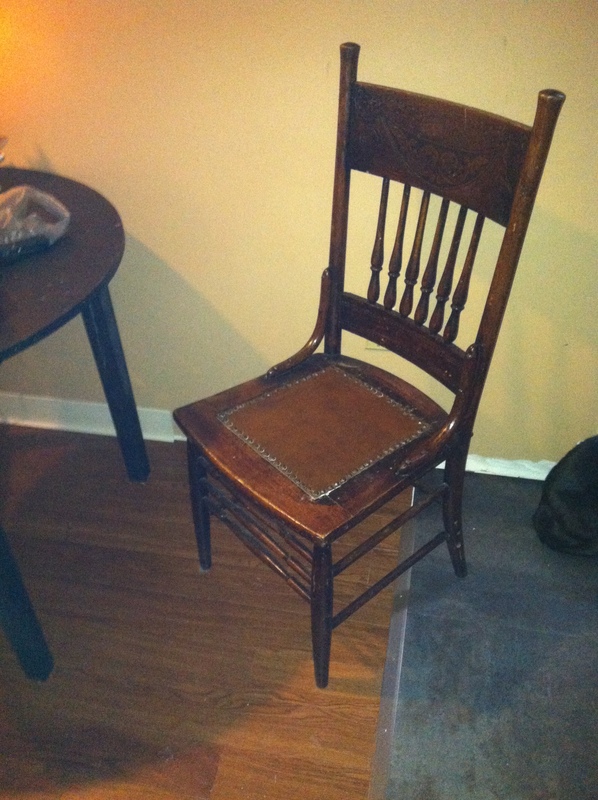 So…..I am hoping, you the viewer, will help me decide what to do with this chair! Thanks in advance and remember: Go forth and dezign!